Vonn came back from a crash in the world championship super giant slalom to win a final medal in the downhill discipline. One of the most successful skiers in history, she had announced that this race would be her last. After a series of tense draws over the last few weeks, reigning champion Magnus Carlsen stepped up to win 3-0 in the deciding tie-breakers on Wednesday in London. The Norwegian has held the world title since 2013. 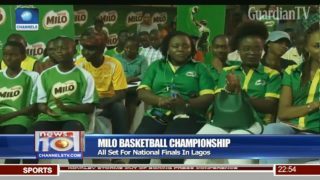 Milo basketball championship - all set for national finals in Lagos.